After a timely update to the site heralding the New Years dawning all resolutions to make a monthly revisit were promptly broken & 8 months later I’m trying to remember just what has gone on since Xmas ’07. From rebuilding a 501xxx engine – with a gear drive cam conversion – for use in the ’08 MotoGiro D’Italia via more work on my 250 race engine to the current preparation of my 175 MSDS for the MotoGiro UK the weeks have flown by. I’ll update the site with details of the above later & major on the events where the Parillas have been used before the public. 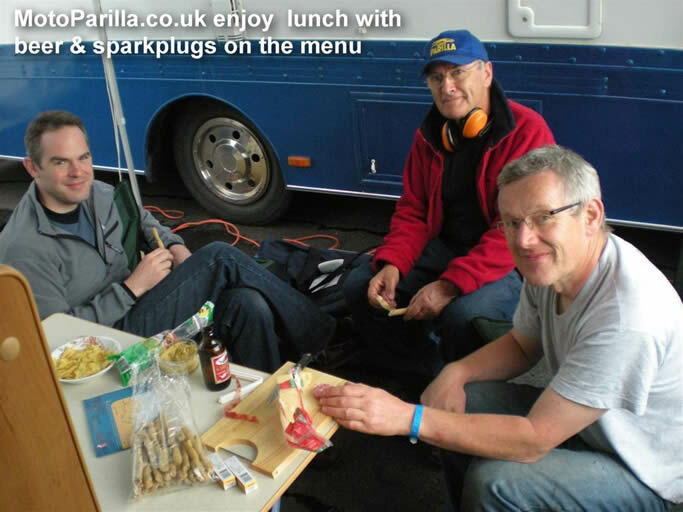 Our first Parilla UK track get together was one at which no bikes appeared! However, it was the first meeting of RM, Craig & I for the purpose of riding motorcycles around the classic Spa-Francorchamps circuit in Belgium. Lesser marques (H***a & D****i) were our steeds for the weekend but plenty of Parilla jaw racing took place between beers. In the last chapter I wrote on this subject, I highlighted the problems we had encountered in testing, particularly at Schleiz, with the standard Parilla clutch, copper cylinder head gasket and carburation with the 32 mm SS1 Dellorto. 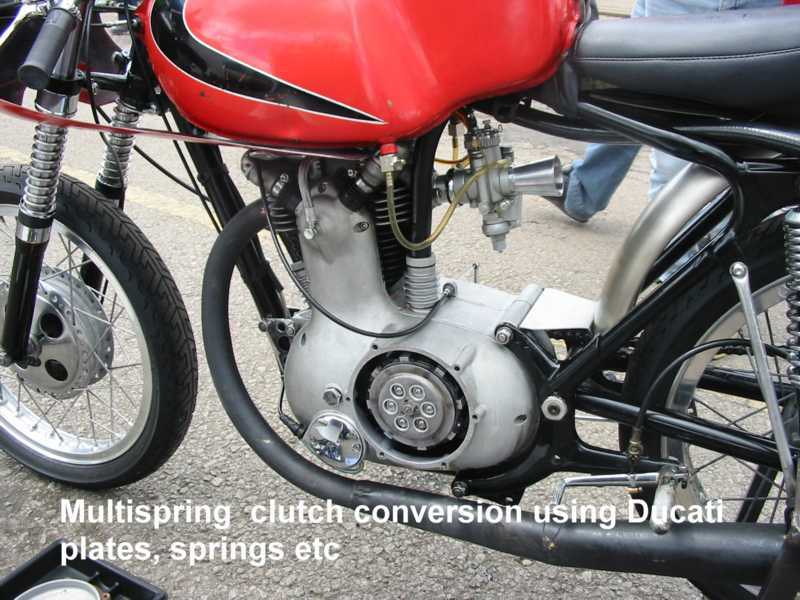 After experimenting with different clutch setting, plates and spring pressures Mike (MM) and I came to the conclusion that the only way forward, to solve all of the known clutch problems, was to revert to a racing clutch very similar in design to the clutches provided to me by Moto Parilla in 1964 and fitted to my 3 race bikes. As the original Parilla racing clutches are no longer available we turned to Nova Racing Transmissions who agreed to manufacture a batch of 6 Ducati type racing clutches which have been completed and can be adapted to fit standard Parilla 4 & 5 speed or Nova 6 speed gearbox mainshafts. In addition to re machining the cylinder head stud flanges as described in the last chapter, MM succeeded in finding a UK Supplier to undertake the manufacture of composite head gaskets of a similar material and design to the original Parilla gaskets, as used with much success in 1964. To address the carburettor calibration problems I reverted to fitting a N.O.S 30 mm SS1 Dellorto racing carb which I was fortunate to locate in the USA. Having completely rebuilt the engine and gearbox of RM64 since the Schleiz outing, all of the above modifications (and many others)! 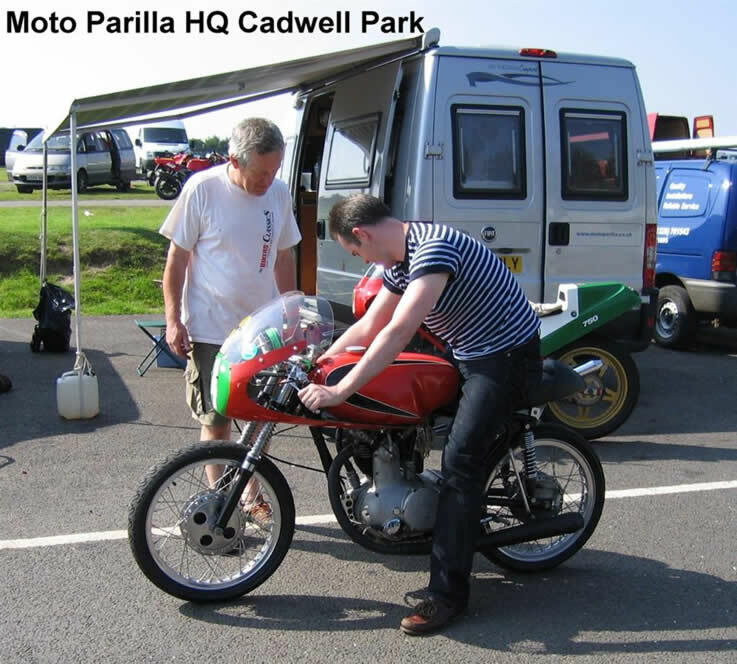 were put to the test when I entered RM64 in the VMCC Festival of 1000 Bikes at Mallory Park on the 13th July and again when I rode the bike in many sessions at Cadwell Park on the 24th of July. 2008. From the moment MM and I started RM64 in the paddock at Mallory Park we knew we had made a significant leap forward with the bike’s development and so it was to prove for the rest of the day and at the subsequent meeting at Cadwell. With the past clutch, head gasket and carburation problems now appearing to be behind us we spent the rest of our time at the 2 meetings just fueling up and adjusting gearing and suspension settings, the bike just got better and better. Whilst good progress has been made this year. 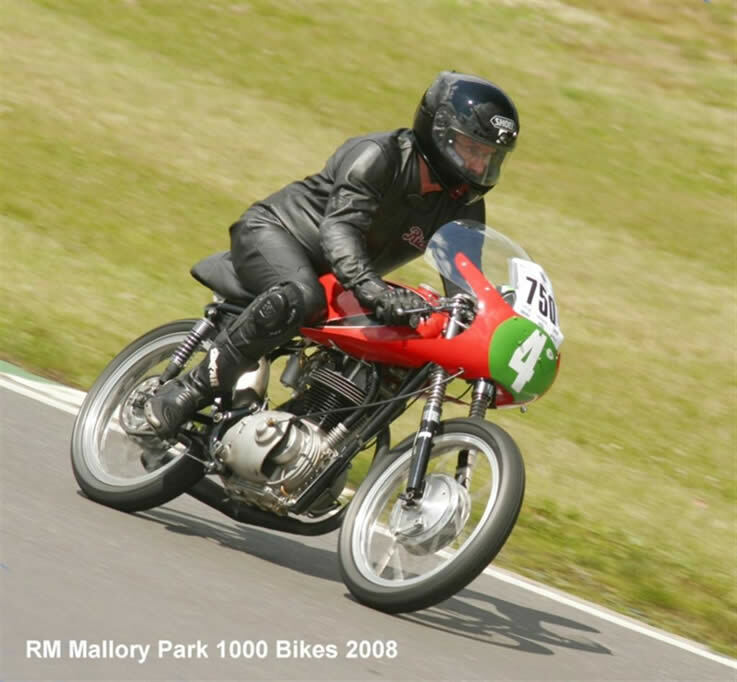 the RM64 restoration program is not complete as there are a number of items to be sorted including the development of a new exhaust/mega which will look like the original but meet the current noise limitations. A front mudguard and a strengthened rear hub are also in the pipeline. In addition to the developments described above, work is slowly but surely continuing on my 2nd ‘high spec’ 250 cc Parilla engine. This engine specification will include an Arrow connecting rod, light weight cam followers and G&S 6 mm dia stem valves, chain drive high cam and Nova racing clutch, all as currently fitted to RM64. The higher spec elements will include a twin plug head, programmable electronic ignition, forged racing piston and may even include a Nikasil alloy barrel if the current owner of the barrel can be persuaded to part with it! A new 6 speed gearbox has already been fitted into the crank cases and matched up to the Nova Racing clutch. Once completed and tested, it should be interesting to see what level of performance can be achieved with the ‘high spec’ engine in comparison with the engine currently fitted into RM64. I hope back to back testing can be carried out, initially on the dyno, by the end of 2008 or early in 2009. All results from testing will be reported”. 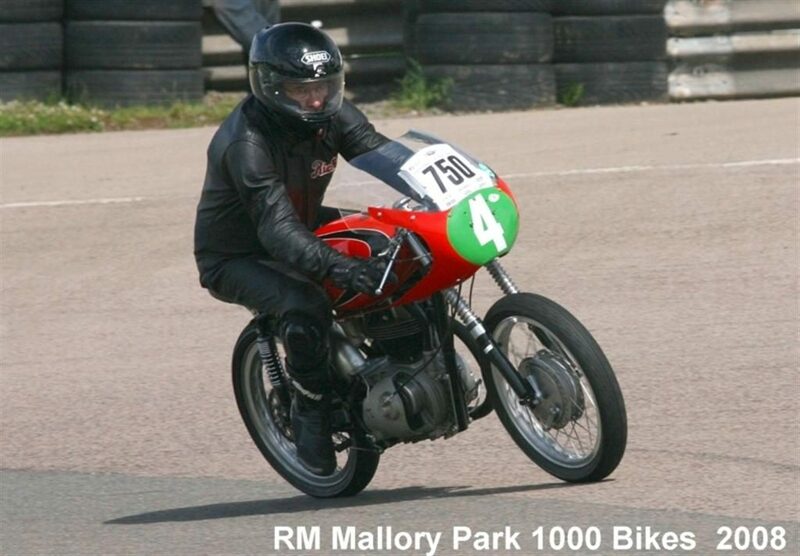 Next, Richard’s 256cc (350 Class) rediscovered…. 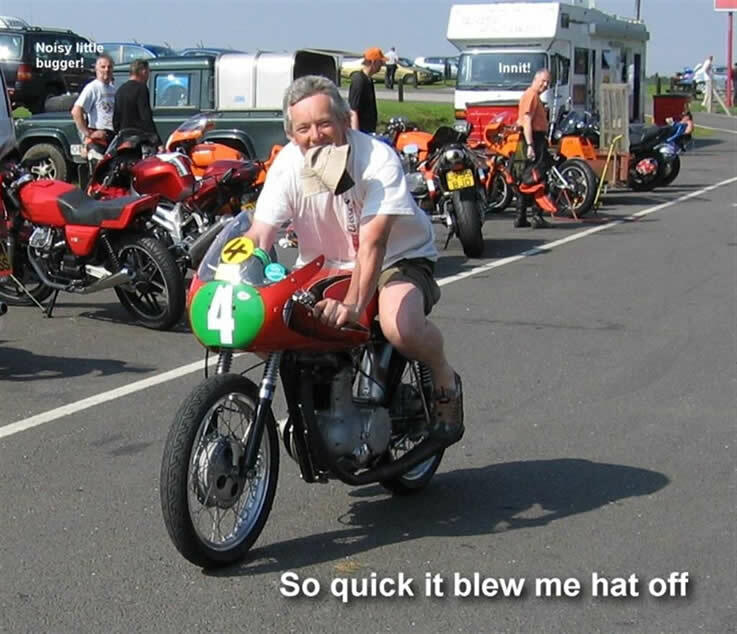 I’ll eat my hat if it runs!